At the beginning of any trip to Edenton, NC, make your first stop at the Historic Edenton Visitor Center. Learn about the variety of tours they offer that expose you to 300 years of Edenton's abundant history and culture. The visitor center itself features exhibits and displays inside, along with a helpful assortment of maps and resources for Edenton and Chowan County. This is also where you can sign up for their tours of the 1767 Chowan County Courthouse, the 1886 Roanoke River Lighthouse, the James Iredell House, the 1758 Cupola House and the Harriet Jacobs tour. 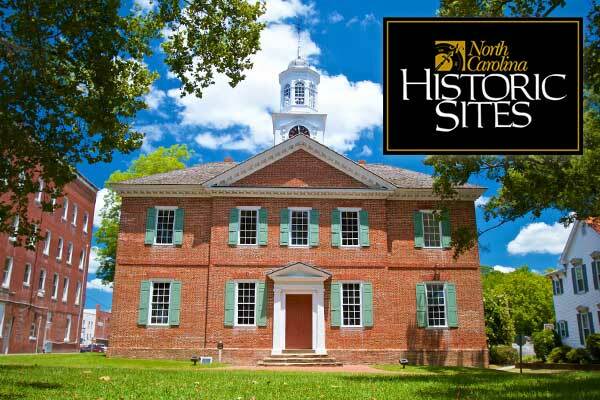 Their knowledgeable guides take you to North Carolina's oldest courthouse that's still in operation, one of the few remaining screw-pile lighthouses and historic sites rich with stories and significance. Historic Edenton State Historic Site is a North Carolina State Historic Site that offers tours of many of Edenton’s historic homes and buildings. Visit the Historic Edenton Visitor’s Center at 108 N. Broad Street to view changing museum exhibitions, a free video on the town’s history and the fourth order Fresnel lens. Visitors can also purchase tickets here for tours of the downtown historic sites. Historic Edenton State Historic Site manages the 1800/1827 James Iredell House, the 1767 Chowan County Courthouse and the 1886 Roanoke River Lighthouse. A docent will give you a tour of the 1886 Roanoke River Lighthouse and the 1767 Chowan County Courthouse any time from 10 a.m. to 4 p.m., Tuesday through Saturday. The 1800/1827 James Iredell House tour begins daily at 2 p.m. Tickets for each tour are $2.50 for adults, $1.50 for children, or you can purchase an All Sites Pass for $5.00 adult, $3.00 children. Tickets are available at the Historic Edenton Visitor’s Center at 108 N. Broad Street, at the 1886 Roanoke River Lighthouse at 7 Dock Street or at the 1767 Chowan County Courthouse at 117 E. King Street, (cash or check). Call (252) 482-2637 or email edenton@ncdcr.gov to book a group tour or make your reservation for a special tour, coach tour or school field trip.